Bourbon Street is always wild but it gets even wilder for Halloween celebrations. Wear your favorite costume and go on down to see the sights. But Bourbon Street isn't the only place in New Orleans that's a lot of fun on Halloween. Frenchmen Street in the Marigny, with its live music, restaurants, and bars, is also a place to be, especially if you're in costume. And if you want a full-on Halloween experience in the Big Easy, stay at one of these haunted hotels. The Voodoo Music + Arts Experience takes place in New Orleans on Halloween weekend in City Park and lasts for three days. It wouldn't be New Orleans if there wasn't great music on the scene, and there will be, with several main stages where a long list of performers will keep the tunes flowing. There's art and a food court, chocolate, and wine, along with a marketplace for a little shopping. What could be scarier than a tour of an old cemetery, complete with above-ground tombs? New Orleans has several old cemeteries—nicknamed Cities of the Dead—that date back to the late 18th century, and they include Lafayette Cemetery in the Garden District, which has been used in several movies. There are several tours that take you through some of New Orlean's most famous cemeteries. This parade, which became the official New Orleans Halloween parade in 2007, has scary, three-dimensional props and floats designed by the renowned Kern Studio. On Halloween night, monsters rule. The parade begins at Elysian Fields in the Marigny, goes through the French Quarter, down Canal Street, and ends at the National World War II Museum. The paraders also throw out fun collectibles like coffee and plushies to those watching. 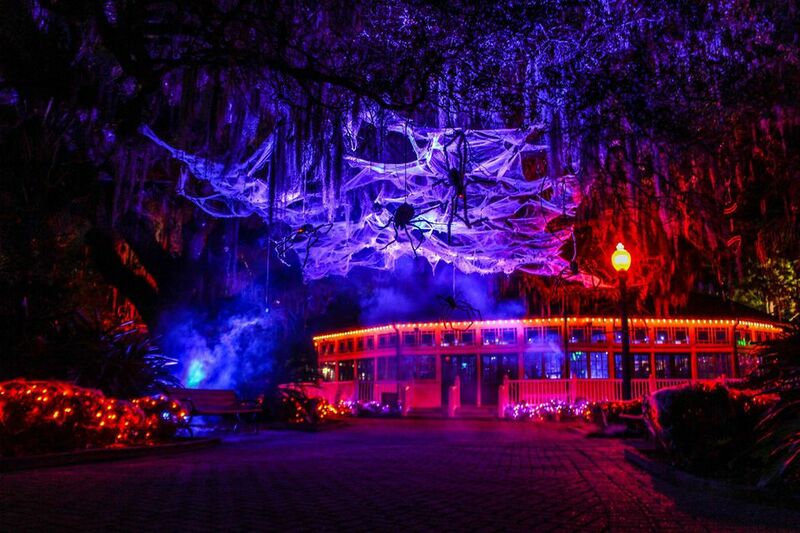 For the kids, there's Halloween fun every year at the Audubon Zoo. The zoo will hold its annual Halloween extravaganza from October 26-28. The zoo will close early and families with children under 12 can enjoy games, a haunted house, the ghost train, and, of course, trick-or-treating, all free of charge with the $20 admission ticket. Costumes are definitely welcome. The Gallier Historic House Museum on Royal Street in the French Quarter is fun to visit any time of the year to see how the Creoles lived in early New Orleans. But during October, the historic house is in mourning, with displays of funeral clothing and mourning articles of the Victorian era. The tours will explore the culutral significance of death in New Orleans and how people mourned in the Victorian era. This year the mourning begins on October 18. Ghosts in the Oaks takes place annually in late October in the Carousel Gardens Amusement Park and includes trick-or-treating, rides, and a pumpkin patch. Each year it acts as a fundraiser for a City of New Orleans entity, so you'll be helping to make add quality to New Orleans while you and your kids are having Halloween fun. This year it will go from October 19–21. If you have always thought a masquerade ball would be loads of fun, check out this annual event on Halloween weekend in New Orleans. Costumes are the point, so there are very strict costume rules. But fret not! Their website will tell you everything you need to properly vamp yourself up. Go all out and dress up like you're a kid and then join in the revelry at this prime Halloween event. Ghostly Galavant takes you on a nighttime walking tour of some of the best haunted sites in New Orleans, and your guide will give you all the scary details. You'll walk past sites featured on paranormal TV shows such as "American Horror Story: Coven" and "Ghosthunters." The tour starts by the Court of Appeals and goes by Jackson Square, Pirate's Alley, Lalaurie Mansion and plenty more before ending in the French Market. This bona fide Halloween experience will really get you in the mood for a spook-filled night.